Witte Molen PUUR Vegetables Hay is pure and healthy hay for your rodent. A truly essential addition to the daily menu of your rabbit, guinea pig, chinchilla or degu. Witte Molen Bloemen hay has a high raw fiber content and thus contributes to healthy digestion and healthy teeth. Boredom also has no chance thanks to the pleasant and tasty nibbling. Your rodent will enjoy pure flavors from nature! 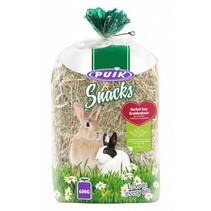 Always provide hay for the stay of your rabbit or rodent. It is an ideal supplement to the daily diet and can be made available indefinitely. Keep the stay of your rabbit or rodent clean: change this hay regularly (once or twice a week).